Daily Messes: Sneak Some Zucchini Onto Your Neighbor's Porch Day! Sneak Some Zucchini Onto Your Neighbor's Porch Day! You may be asking yourself why you have a bundle of zucchini on your front porch. Today is Sneak Some Zucchini Onto Your Neighbor's Porch Day! 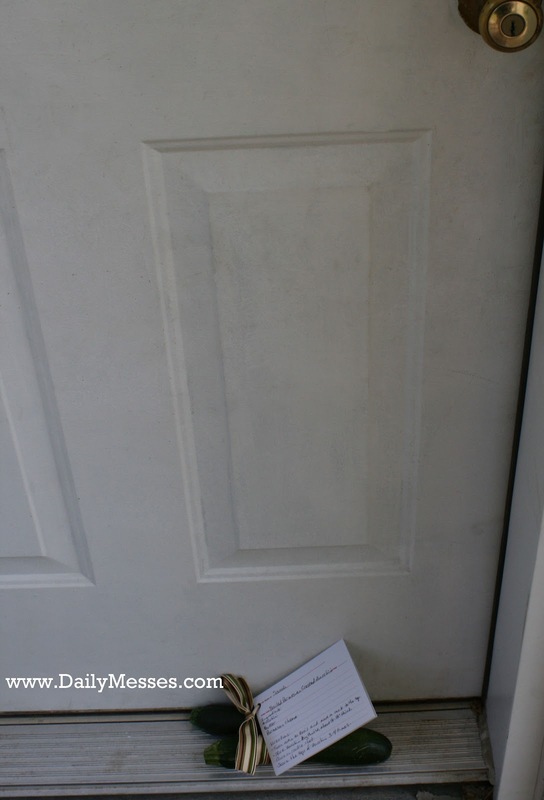 In honor of this momentous holiday, I decided to celebrate by leaving some zucchini on one of my neighbor's porches. You are the lucky winner! 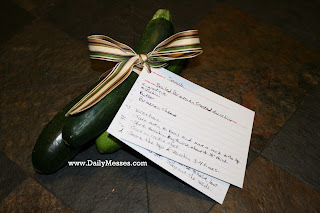 I included recipe cards for my two favorite zucchini recipes: Broiled Parmesan Crusted Zucchini and Stuffed Zucchini. I hope you enjoy the zucchini!